Dorchester Hotel and Suites offers luxury fused with incredible service. 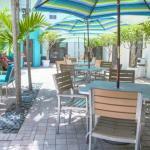 It boasts a private courtyard with nicely manicured gardens and intimate areas. Trees abound in the place and if you want to swim, there is a heated pool located outside. Upon entering the lobby, you will see exquisite glass artwork, and modern furniture against a brick wall backdrop. Service is very efficient at the Dorchester Hotel and Suites and it would only take a few minutes before you get to lie down on the ultra-comfortable bed inside your hotel room. Hotel rooms at the Dorchester have beach access to the Marseilles Hotel nestled near the ocean. All rooms boast safety deposit boxes, mini bars, all-natural amenities, wireless internet access, ironing facilities, and hair dryers. Guests can choose from smoking and non smoking rooms. The hotel has a breakfast lounge, a heated pool, and onsite parking. Guests can also call the front desk for Dorchester Hotels dry cleaning and laundry services. For guests who need some assistance with their tour itineraries, the clerk at the concierge desk will be able to help. Other services available upon request are massage services and turndown service. The hotel is also equipped with a large conference room and an exercise Studio. Parking: Yes, there is parking. Additional fees apply.